Edraw is a powerful yet easy-to-use sipoc software coming with extensive built-in shapes and symbols, which makes it easy to create good-looking SIPOC diagrams. It lets you make SIPOC charts based on ready-made SIPOC templates combined with your own text and pictures. In this way, a great amount of time can be saved. You can achieve the best visual result with the least effort. Download a free trial and see first-hand how quickly and easily you can create great-looking SIPOC diagram. 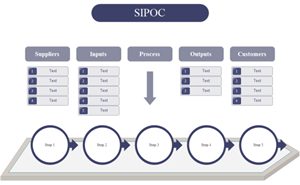 The SIPOC diagram is a fairly straightforward process map that looks at the process at a relatively high level. It is a visual tool for documenting a business process from beginning to end, which is very useful at the start of a project helping team members agree upon a common language and understanding the whole process. Suppliers: This refers to the sources of the key material, information or service. Inputs: Inputs are items that are involved or used in the process such as the materials, data, knowledge, information, or ideas. Process: It's the main activities that transform inputs to outputs. 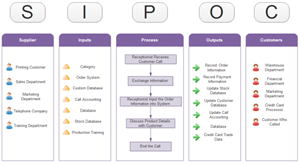 Outputs: Outputs are the end results of the process, can be products, service, reports, documents, information, etc. Customers: Customers are the persons or entities that receives the outputs. Easy to learn and easy to use. Just drag the ready-made shapes from the library pane and drop them on your page. In just a few minutes you can, without any professional drawing skill, make your own SIPOC chart. Rich pre-made templates allow you to modify from existing structures, rather than start from scratch. A set of nice looking themes with advanced effects make it easy to change the whole diagram by changing the active theme with just a few clicks. Enhanced export features include BMP, JPEG, EMF, WMF, PDF, SVG, HTML, Word, PPT, Powerpoint and much more format. It's easy to add photos, images and edit text fields. 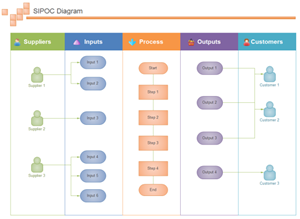 Edraw SIPOC software includes some examples and templates to help you get started directly. You can open these examples and modify them to meet your requirement. 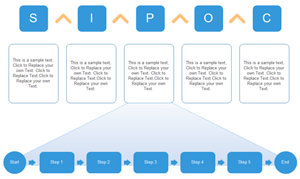 Editable, printable and sharable, this sipoc template is provided to benefit more users. 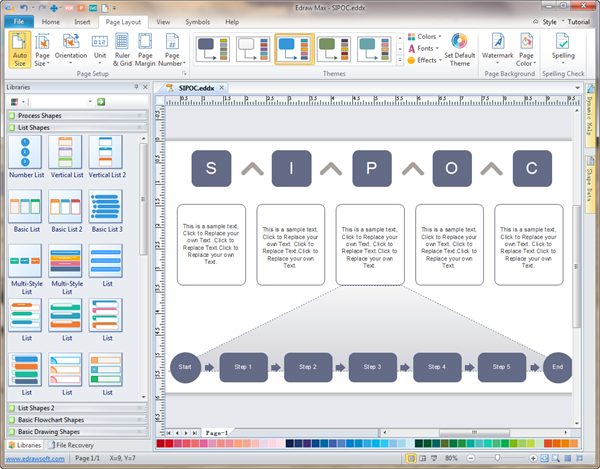 Download this editable sipoc template and redesign it to fit your own needs. 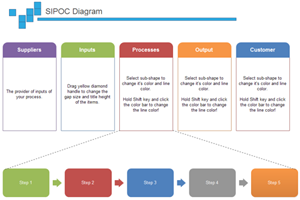 A sipoc diagram template is elaborately prepared in vector format for your own designs. Click the hyperlinked picture to download it. Consider this example when you make your own sipoc diagram. It lets you quickly finish your design work and enhance your work efficiency. Click the picture to have a full view of the example and download it for your own use.